I recently asked a question about odd results from a transfer function, and while looking over my work, I conjectured that maybe I'm having a more fundamental problem. Since this is a design problem I don't expect anyone to give a full-fledged answer, but any hints or prodding in the right direction would be appreciated. Here goes. Pushing the gimbal (giving it an impulse $\delta$) will move it some finite distance $x$. This is equivalent to having an impulse response that converges to a finite value. The gimbal has a resonant frequency of $\omega$. 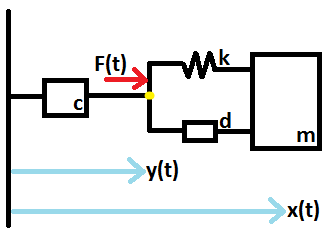 Since I will be using active PID control on it in Simulink, if I attempt to drive the gimbal with a forcing frequency near $\omega$, I should expect high amplitude oscillations in the position $x$. These two responses combined will produce a very realistic expectation: pushing on the gimbal will move it (though damping will slow it down to a halt if the force is removed), but if you get near the resonance frequency of the structure, you'll excite the first elastic mode and have large-amplitude oscillations. However, if you look at the link I've provided, I'm having a whole host of problems reproducing the two required conditions in my model. I think something is wrong with how I've modeled the system, but I don't quite know what's going wrong. Any help would be greatly appreciated. Further, if anyone knows of papers that describe modeling of one-axis gimbal systems (I've found plenty on two-axis gimbal systems, but those are way too complicated for what I'm trying to accomplish here), that would also be helpful. In my "day job" I do a lot of (mostly nonlinear!) dynamics modelling and simulation of mechanical systems. One thing that always raises a "red flag" for me is degrees of freedom with no mass, especially if they are at places where somebody is trying to apply a load to the model, as you have done. I'm assuming that in the physical structure there is a rod of shaft connecting the "payload" (i.e. the mass $m$) to the "motor" (which applies the force $F$ ). The shaft will have a torsional stiffness (modelled by your $k$) but it also has some mass. The rotating part of the motor also has mass - possibly more than the connecting shaft. The model should be capable of representing the basic behaviour of the system if you remove all the damping. With no damping, your model has no "resonant frequency" at all. It is just a disconnected mass, with a massless spring attached to it. Trying to create a non-zero-frequency vibration mode from nowhere by adding the dampers isn't likely to work. But if you add a second mass at the point where the force is applied, representing the real mass of the shaft and the rotating part of the motor, then (again ignoring the dampers) you now have a two-degree-of-freedom system with two modes. One mode is a zero-frequency mode corresponding to free rotation at constant angular velocity, the other is your "resonance" with a non-zero frequency $\omega$. The two modes now represent the two "interesting" things that physical structure does, and two dampers will act to control those two modes. It's a reasonable guess that $c$ will mainly damp out the rigid body rotation, and $d$ will mainly damp out the unwanted vibration in the drive shaft. Note: The $m$ and $k$ in your model would create a vibration mode if you applied a fixed-amplitude displacement to the end of the spring, instead of a force. That would be equivalent to mounting $m$ and $k$ on a vibration testing table and shaking the end of the spring. But if you try to use the model in that way, the damper $c$ is irrelevant, because it has a prescribed displacement at both ends (one end fixed, the other end moving). But the way I interpret your diagram and description, $F$ is meant to represent a force, not a displacement. Not the answer you're looking for? Browse other questions tagged mechanical-engineering dynamics systems-design or ask your own question.